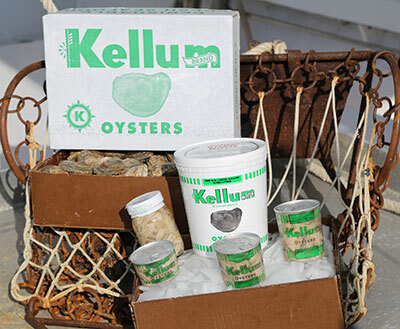 Kellum Brand Oysters are offered as both live in the shell product as well as fresh and frozen shucked oysters at Kroger, Whole Foods and many fine retail and restaurant establishments. Our premium product comes from certified healthy oyster stock grown on Virginia and company owned oyster beds in the Northern Neck, Middle Peninsula and Chesapeake Bay. Market Forms: Live in shell, fresh shucked (in pints, quarts or gallons), frozen (breaded and unbreaded). Size: Market size is approximately 3 inches for oysters in the shell. Shucked oysters are designated according to size ranging from the largest "counts" to "small". Substitutability: Nothing else tastes quite like Crassostrea virginica, so named because biologists first identified it on Virginia's shores. In fact, blind taste comparisons with its Pacific cousin, the Eastern oyster was voted best tasting by 85% of those polled. For nutritional information on our scallops, click here. To view our sanitation certificate, click here.